In the 19th century, Lydia Maria Child’s name was nearly a household word. An outspoken abolitionist, women’s rights supporter, and crusader for Native American rights, Child was also a prolific author. A journalist and editor, she wrote novels and short stories (often using fiction to express her anti-slavery views), poems and children’s books, and domestic manuals for wives and mothers. Her most famous book – which went into 33 printings – was The Frugal Housewife, first published in 1829. Four years later, she published An Appeal in Favor of That Class of Americans Called Africans, believed to be the first anti-slavery book published in the United States. She also served as editor for Harriet Jacobs’s influential 1861 slave narrative, Incidents in the Life of a Slave Girl. In all, Child wrote more than 50 books. Though Child was very prominent in her time, she comes down to us now primarily as the author of a poem originally published as “The New-England Boy’s Song about Thanksgiving Day” – more popularly known to us as “Over the River and Through the Wood.” It was included in her 1844 book, Flowers for Children. The poem features Child’s reminiscences about visiting her grandfather’s house during the cold New England winters. If you want to go even further in your exploration of this key 19th-century writer, you might want to read Lori Kenschaft’s book Lydia Maria Child: The Quest for Racial Justice or Carolyn L. Karcher’s book The First Woman in the Republic: A Cultural Biography of Lydia Maria Child . A Lydia Maria Child Reader is also available. And believe it or not, you can still buy a copy of The American Frugal Housewife . Not surprisingly, many children’s picture books have taken “Over the River and Through the Wood” as their subject. I am particularly enchanted with Mary Engelbreit’s version . Another lovely book is Over the River and Through the Wood: An Anthology of Nineteenth-Century American Children’s Poetry . Wherever Thanksgiving Day finds you this year, take a moment to revisit Lydia Maria Child’s classic poem celebrating the holiday. Listen:Listen as I read Lydia Maria Child’s 1844 poem “The New-England Boy’s Song about Thanksgiving Day,” also known as “Over the River and Through the Wood.” You can follow along with the text at The Poetry Foundation. 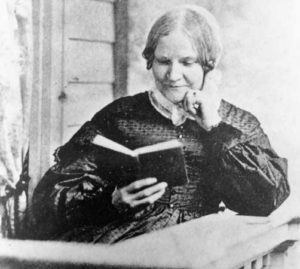 Image Credit: Lydia Maria Child reading a book about 1870. Public domain. https://commons.wikimedia.org/wiki/File:Lydia_Maria_Child.jpg. I was thankful to hear you reading “The New-England Boy’s Song about Thanksgiving Day” The poem brings back fond Thanksgiving memories. Thanks for another great StoryWeb.